Many business professionals choose to paint their office walls grey. After all, grey is one of the safest colors for a workspace especially because it allows people to create a neat and calming environment. But using the color grey efficiently can be quite difficult, considering the wide range of tones available nowadays. First, grey should not be used to decorate north-facing rooms. Since a north-facing interior receives less natural light than a space with eastern, western, or southern exposure, the color grey can make the room feel darker and smaller. In this case, opting for a warm pastel, such as light yellow or orange, can help enhance the overall ambiance of your workspace. If you still think that grey is the perfect color for your business, it’s important to know how to choose the right shade of grey paint to add style, sophistication, and glamour to your space. 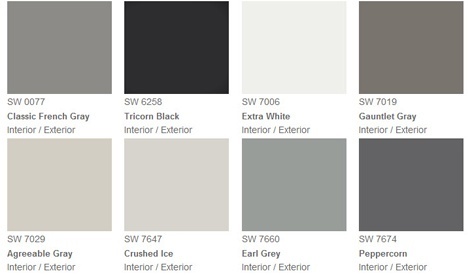 Here are some hints on picking the perfect grey for your business. Light grey – Considered a cold color, light grey is actually a subtle, inviting shade that confers a feeling of openness especially to small spaces. For a more unique, interesting, and inviting atmosphere, a great idea would be to choose a light silvery-grey sheen. Deep grey – More subdued than light grey, deep greys exude a feeling of elegance, while creating a vivid contrast with bright colors, such as light yellow, lime green, or cranberry red. You can create a more complex, layered (and amazing) effect by pairing several shades of deep grey together. Beige-based grey – Commonly referred to as greige, grey with beige undertones adds warmth to workspaces especially when it’s coupled with bold accents, such as vivid yellow, grassy green, or burnt orange. Though many people are hesitant to use these intense hues, they can deliver some splendid color schemes when combined with greige. Green-based grey – Green-based greys are the most neutral shades of the grey color family. Yet they can add casual elegance to any space. A great thing about using grey with a green undertone is that it can complement successfully a wide range of wood tones. Blue-based grey – Blue-based greys are cool shades that should be combined with bold accents or decorations in warm colors to create a balanced color scheme. For instance, you could complement your blue-grey office setting with a purple or dark red accent wall or with wall art made of a “warm” metal, such as copper or brass. Purple-based grey – When it comes to creating the desired ambiance in an office, nothing compares to a purple-based grey scheme. Soothing and relaxing, a purple-based grey can add a “sweet” twist to your business, without making it look feminine. A small piece of advice: never use purple-based greys in combination with orange or red accents, or you’ll end up with a discordant color scheme. Just like any other neutral, the color grey can be mixed with many other hues, such as red, pink, orange, and yellow, to create a dazzling yet serene environment. Additionally, grey is an ideal backdrop for any style, be it classic, modern, contemporary, Italian, French, Oriental, and the like. Though choosing the right color grey for your workspace is a matter of personal taste, the absolute best way to pick a shade that perfectly compliments your office space is to have our professional painters come in and help you. Contact our team at (904)-641-4800 or email info@performance-painting.com for a free, no-obligation quote and for any other details you may need for your painting project.